1. Building resilience against genocide requires critical thinking about the process of identity-based violence and its reversal. 2. The content of peace education programmes matters: interactive role-play type activities have been shown to have a longer lasting impact. 3. Unhealed wounds need to be addressed to prevent a repeat of violence; psychosocial support must accompany peace education to reduce anxiety, which can be an obstacle when accessing empathy. The Aegis Trust’s peace-building work in Rwanda began ahead of the establishment of the Kigali Genocide Memorial that opened in 2004. From 2013-16 Aegis led the Rwanda Peace Education Programme, a partnership including Radio La Benevolencija (producer of the Radio broadcast “Musekeweya” -New Dawn), the Institute of Research and Dialogue for Peace (IRDP) and the USC Shoah Foundation. This programme contributed to delivering peace education training to more than 60,000 educators, young Rwandans and Rwandan communities. A major achievement resulting from the consortium’s advocacy has been that the Government of Rwanda through the Ministry of Education has integrated Peace and Values education into the school curriculum. In a new phase of work Aegis is now supporting the implementation of the revised national curriculum that has integrated peace and values education (2016-19). At the Colloquium in February, panellists examined the social, political and cultural triggers that enable the process of dehumanisation. Individuals are not born violent, they are socialised into becoming violent. Understanding the process of dehumanisation and its reversal was explored by speakers drawing out valuable insights. Experiences of peace education in different contexts demonstrated how interactive content, such as role-plays or interactive exercises have a major influence on longer-term attitudinal changes. Core skills, values and knowledge that are central to peace education include critical thinking, listening, empathy, trust, and personal responsibility. Interlinkages between these values were explored, deepening our understanding of how unresolved trauma can affect the ability to empathise. Critical thinking and positive values were discussed confirming that critical thinking on its own is not enough to promote peace. It must be accompanied by positive values (empathy, caring) as these guide us in what we decide to think or do. Developing individuals’ sense of personal responsibility is closely linked with their sense of agency (their belief that they can act or make a difference). The sharing of a range of experiences of working with these values affirmed existing best practice. A range of approaches and tools to measure peace, the risk of genocide, and individual attitude changes were discussed, providing invaluable insights on impact assessment to participating organisations. Resulting from the Colloquium Aegis has been working on its own Impact Tool to assess increased resilience to identity-based violence or genocide. 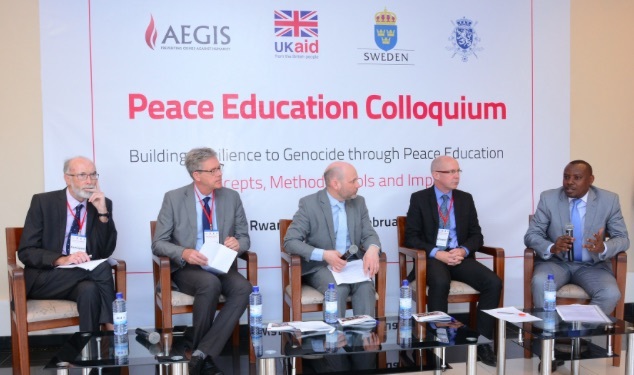 The Aegis Trust extends thanks to the UK Department for International Development (DfID) for funding the Colloquium and the Genocide Research and Reconciliation Programme.